Could Afghanistan Be a Model for US-China Cooperation? The two powers have interests in Afghanistan that are not incompatible. China’s role as a major player in the field of foreign aid and investment will be on full display at the Asian African Conference in Jakarta, Indonesia this week. Chinese President Xi Jinping will deliver a keynote address at the conference’s Business Summit, with representatives from more than one hundred Asian and African countries. According to AidData, between 2000 and 2012, China committed approximately $83.3 billion to development projects in Africa alone. How should America and those that share its values respond? There are legitimate criticisms of China’s approach to development, like a seeming propensity to violate environmental and labor standards. However, China’s ambitions also present an opportunity for America to promote important security interests without compromising on core values. The United States Agency for International Development has piloted “trilateral cooperation” with middle income countries including Brazil, Thailand, India, and Indonesia. The time has come for the world’s two largest economies to think critically about partnerships to further third countries’ development. Afghanistan is one place they can start. 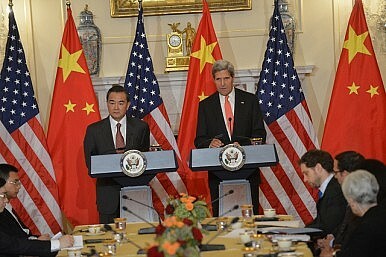 The U.S. and China both have an interest in a peaceful and self-sustaining Afghanistan. On the diplomatic front, the U.S., China, and Afghanistan have already been engaged in trilateral cooperation. At the London Conference, a multilateral event, senior officials from the three countries met privately to discuss Afghanistan’s future. Recent statements from China’s representative at the UN Security Council indicate a willingness to act as a mediator in Afghan peace and reconciliation process. The reasons for Chinese and U.S. interest in Afghanistan are clear. From the U.S. perspective, President Barack Obama’s decision to slow the withdrawal of troops through 2015 underscores the importance his administration attaches to the outcome of America’s engagement there. From China’s perspective, the shared border between Afghanistan and China’s Xinjiang Uyghur Autonomous Region means that China will continue to have a stake in its neighbor’s stability. Xi’s “One Belt One Road” development strategy envisions Chinese-built oil pipelines, telecom, and high-speed rail crossing Central Asia and bridging China, the Middle East, and Europe with Xinjiang as the hub. Further, the possibility that separatist Uyghur fighters may receive training in the lawless Afghanistan-Pakistan border region presents China with a troublesome vulnerability. Peace with the Taliban starts with establishing trust between the Afghan government and the Pakistani government, which has provided a safe harbor to Taliban insurgents. U.S. pressure on Pakistan has had limited effects, but China’s entry into the conversation could reshape the dialogue. As close allies and “all weather friends” with Pakistan, China is well positioned to play the role of honest broker, particularly given the fact that U.S.-Pakistani relations have deteriorated since they were declared a key partner in the global war on terror over a decade ago. Afghanistan needs a government that can bring infrastructure, jobs, education, healthcare, and justice to its people for any lasting peace. Both the U.S. and China have made investments in Afghanistan’s development, yet they take different approaches. Of the $1.594 billion in U.S. assistance to Afghanistan in FY2015, about 19 percent is solely dedicated to the country’s economic development. The remainder covers peace and security, democracy and governance, health, education, and social services, and surely, these underpin sustainable, long-term growth. China’s contribution in Afghanistan pales in an absolute sense, but in Afghanistan and throughout the world, China has made targeted investments in infrastructure and natural resource extraction (much for its own consumption). Put in context, China’s recent promise of $327 million (RMB 2 billion) to Afghanistan over the next two years is not insignificant; U.S. assistance toward infrastructure in Afghanistan this year stands at $69 million. The countries’ divergent approaches to development are rooted in ideological differences. China’s rhetoric emphasizes its policy of non-interference in the domestic politics of sovereign governments. This principle goes back to the Final Communiqué of the 1955 Bandung Conference. (The event which this week’s Asian-African Conference in Indonesia commemorates.) Western donors are more inclined to link aid with the promotion of good governance as outlined in the Paris Declaration on Aid Effectiveness and the Accra Agenda for Action. Despite their ideological differences, both countries face many of the same challenges on the ground. The crippling costs of endemic Afghan government corruption make any international development efforts challenging, to say the least. According to the Wall Street Journal, an Afghan diplomat admitted that the Afghan government viewed the China Metallurgical Group’s investment in the Aynak copper mine as a “cow to milk” for bribes. The U.S. Special Inspector General for Afghanistan Reconstruction has made similarly bleak assessments on the misuse of U.S. project funds. In the context of Afghanistan, the U.S. and China may more easily broach otherwise sensitive topics – like transparency and openness in procurement. Chinese companies have already reported under the Extractive Industries Transparency Initiative in Central Asian and African countries. A trilateral dialogue allowing exploration of these issues could contribute to mutual understanding and may yield positive results. Each party in the tripartite holds special interest in ensuring a stable and predictable marketplace. Such cooperation is not equivalent to interfering in Afghan domestic politics because President Ashraf Ghani himself has prioritized these problems. Ghani has moved quickly, firing local officials and centralizing billions of dollars in procurement deals under his purview. There are daunting challenges, but he has acknowledged that multi-stakeholder initiatives to promote transparency can be useful to push for reform in government systems. Afghanistan presents challenges and opportunities for both the U.S. and China. Working together, they could fix the significant problems, energize high-level diplomacy, and provide a future model for U.S.-China cooperation. David Caragliano is a lawyer and an international development professional currently managing programs in Asia. Noah Coburn is a professor of political anthropology at Bennington College who served as an election monitor in Afghanistan in 2014. Both are Fellows of the Truman National Security Project. Views expressed are their own.